Rohini Dhand moved with her family from New Delhi, India, to the Wisconsin dairyland when she was 11 years old. At that age, starting at a new school can be difficult. Moving to a brand-new country was especially challenging. Dhand was fortunate to be going to Rice Lake (Wis.) Middle School, which happened to have an exploratory program tied to SkillsUSA (then known as the Vocational Industrial Clubs of America, or VICA). She enjoyed her experience so much, she continued her involvement — this time, officially —as a member of the Rice Lake High chapter. As with many student members, Dhand’s participation started with competing. Her contest was Job Interview. She also became interested in leadership opportunities while participating in Wisconsin’s conference. “I actually ran for a state office. I didn’t get it,” she says. Despite the disappointment of losing, Dhand made such a positive impression that she was encouraged to aim higher. “I was asked by some of the advisors who interviewed me for state office to consider a national office run,” Dhand says, crediting then-state director Bryan Albrecht for being instrumental in encouraging her. Dhand was elected as Region 3 vice president for the 1996-97 school year. As a national officer, she found even more opportunities opening up for her. Rohini Dhand (center) and members of her Hum-sponsored English class and choir. 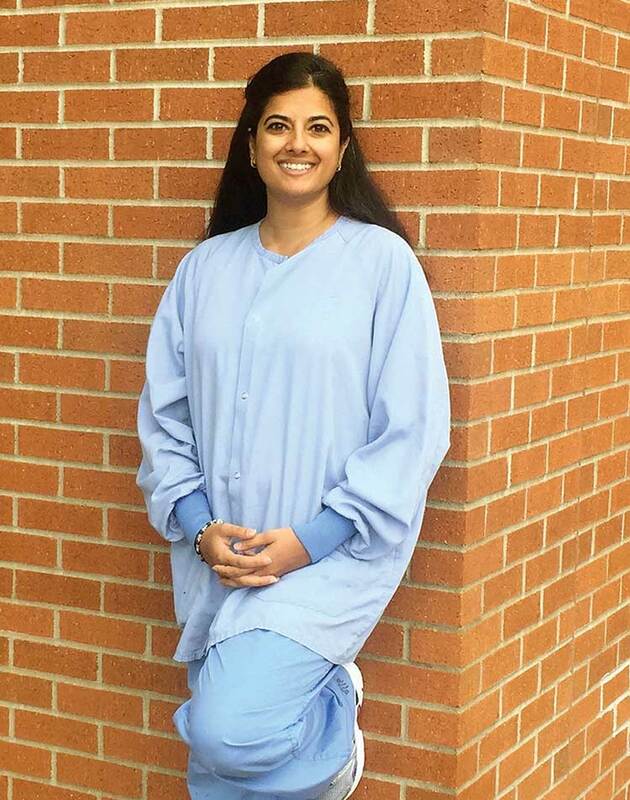 After high school, Dhand continued her education, earning a bachelor’s degree in health sciences with a minor in sociology from Purdue University. After graduating from the Lafayette, Ind., university, Dhand moved to California, where she worked for the Alameda County health department. She also continued her education at the University of California, Berkeley, where she earned a master’s degree in public health, specializing in mothers and children. In 2009, she completed a second bachelor’s program, this time in nursing science. Dhand spent several years after that working in the medical field, first as a nurse in the special care unit at Bassett Healthcare in Cooperstown, N.Y., and later as a labor and delivery nurse at Newark (N.J.) Beth Israel Medical Center. What drove her to achieve so much? “What I learned from being a national officer was to dream big,” she replies. Dhand’s experience in the organization stuck with her, and she had the urge to pay her good fortune forward. Thanks to a timely meeting, Dhand’s next adventure was to make things happen in her native country. “I was fortunate enough to meet with Vipul Prakash, the co-founder of Hum, as he was conceptualizing an idea,” she says. Prakash and Dhand meet with community organizers and Hum partners. Photo used with permission. Hum (which means “we”) is a social enterprise in India. Committed to breaking the cycle of intergenerational poverty, it organizes communities that are at the lower end of the economic scale. As a collective, Hum community members get access to quality goods and services at better prices than they could get on their own, saving between 5 to 12 percent. “Given my background in public health, I had a love of social entrepreneurship and the possibilities it presents to sustainably solve problems,” Dhand says. Prakash had connections in a resettlement colony on the outskirts of Delhi. He was hoping to help the families there save money by leveraging their buying power as a group. Dhand was intrigued, and in January 2013, she moved to India to help get the idea off the ground. Upon her arrival, she became Hum’s co-founder and chief operating officer. Hum eventually expanded its offerings to include employment services, skill development and even English classes. A year after its founding, Hum was awarded recognition as a Top 100 social entrepreneur. Today, it is focused on connecting Indian senior citizens with employment opportunities. In 2015, Dhand returned to Wisconsin, where she is working as manager of outpatient services at Lakeview Medical Center in Rice Lake. She’s come full circle and then some, quite a long way since being that “shy immigrant girl.” With so many significant accomplishments, does she have any advice for new students in SkillsUSA? “Dream big. Keep your eyes on your prize, whatever that is for you,” she begins.